I am Genocyde. It is you, who are beneath me. Position: Strongwoman and nuclear energy wielder. Profile: Commander of the Imperial Forces of the Keepers. Abilities: Genocyde wields the power of nuclear energy. She acquired this ability through a scientific bio-enhancement process. She also possesses super strength and the power of flight. Micanna Zarmore was born in the realm of Cergaron. She was a member of the servant class and was required to serve the lords and ruling class without question. Her family were treated like dogs by the upper class which caused Micanna to develop a strong desire to make a name for herself and finally be respected. When the Keepers rose to prominence she readily embraced their teachings and philosophies. She quickly joined them as she saw it as an opportunity to escape her life of servitude. She embraced their idea of a world without separation and classes. She is a true believer. She considers the High Councilor's plan a righteous cause. 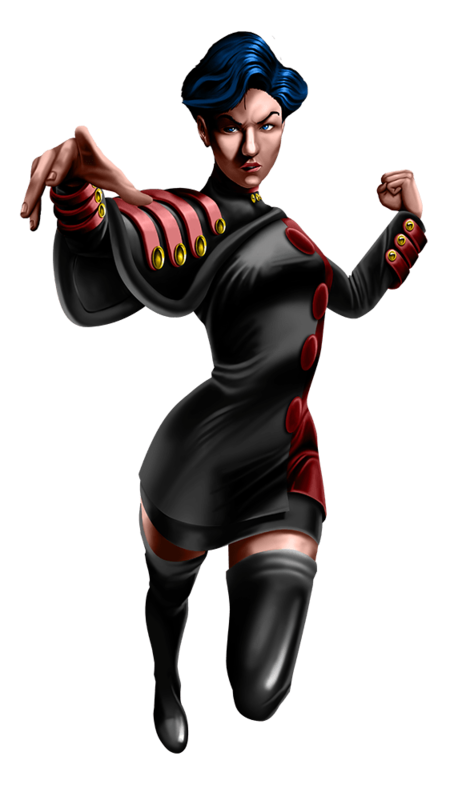 She quickly rose through the ranks and became the leader of the Imperial Guard of The Keepers when it was established. When the High Councilor asked for volunteers for his bio-enhancement soldiers, she was the first to sign up. She once killed five members of her own forces because they deserted the Keepers. Their real crime, however, is that they failed to recognize her rank. She adopted the code name "Genocyde" spelt with a "Y" because she has dedicated herself to terminating all opposition to the plan of the Keepers with extreme prejudice.